Tadhg Beirne wins vital penalty at the death to allow hosts escape with a draw. Leinster: visitors remain top of Conference B.
SEAN O’BRIEN WAS forced off the field after less than half an hour as Leinster were held to a 10-10 draw by the Scarlets in Llanelli. Ireland hoped to have O’Brien available for their potential Grand Slam decider with England at Twickenham but this latest injury setback puts his participation in doubt. A last-minute penalty from Dan Jones snatched victory away from Leinster with Ed Byrne scoring the visitors’ only try. Australian centre Paul Asquith crossed for the Scarlets’ only try of the game. Despite failing to win, Leinster remain top of Conference B in the Guinness Pro14. The visitors made a strong start when full back Dave Kearney made a scintillating break from his own half before Ireland hopeful Tadhg Beirne saved the hosts with an expert turnover. There were worrying signs for Ireland fans when O’Brien was forced from the field with his head in his hands after a double tackle from out half Jones and tighthead prop Werner Kruger. 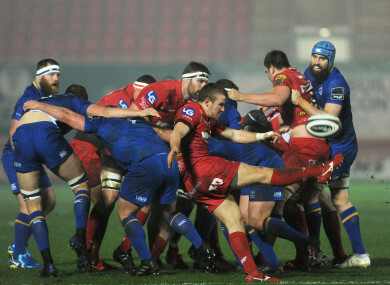 Despite Leinster dominating the vast majority of the first half, the Scarlets looked like they had taken the lead when Tom Williams wriggled over in the right-hand corner after some neat handling from Jones and Asquith. But referee Nigel Owens referred the decision to fellow Welshman and TMO Neil Hennessey who decided the ball had been spilled forward. The visitors began the second period strongly with a period of sustained pressure on the Scarlets line after young winger Ioan Nicholas was forced over his own line. After a number of forward surges by Leinster, Byrne smashed his way over from short range. The try was not immediately given as Owens again referred the decision to his TMO with Hennessy eventually awarding the try which Byrne converted. But the hosts levelled the scores with a brilliantly worked try from classy inside centre Asquith. Following a powerful driving lineout on the half way line, the outstanding Beirne charged up field before offloading to Evans. The ball was then recycled for Asquith to beat three defenders and touch down for a try which Jones converted. Leinster looked to have done enough to seal a hard-fought win when Byrne nailed a penalty with 20 minutes remaining. The Scarlets came back with Tom Varndell having a try disallowed for a knock on before Beirne managed to win a penalty for the hosts resulting in Jones landing the ensuing penalty for a draw. SCARLETS: Williams; Nicholas, Asquith, S Hughes (capt), Conbeer (Varndell 60); Jones, Evans (Smith 75) (Fawcett 75); Price, Elias (Phillips 73), Kruger (Gardiner 59), Cummins (Rawlins 56), Bulbring; Beirne, MacLeod, Boyde. Email “Sean O'Brien's comeback cruelly cut short by injury as Leinster held by Scarlets”. Feedback on “Sean O'Brien's comeback cruelly cut short by injury as Leinster held by Scarlets”.